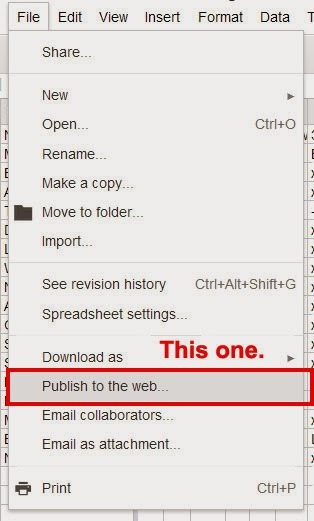 3) Open up your spreadsheet in Google Docs and go to File >> Publish to the Web, and publish it to the web. To make it publicly accessible to the API, you MUST publish it publicly like this! You CANNOT just click the "Share" button and change access rights to share with anyone, that's something different according to the API. Yes, it's confusing. 4) Now before we go back to Unity, we need some way to tell Unity which spreadsheet document to grab. To do that you should copy the document key identifier, that long string of letters and numbers after "key=" in the URL to access your spreadsheet, and save that somewhere for later. It should look something like "1Ak-N8rbAmu7WdGRFdllybTBIaU1Ic0FxYklIbk1vYlE"... and stop at the first ampersand ("&") in the URL, you don't want any ampersands here. 5) Copy and paste the script below into a file like Assets/Scripts/GDocService.cs or something, somewhere in your assets folder. It doesn't matter where they go because the classes have public static functions and thus any script in the project can use them. The "InsecureSecurityPolicy" stuff is to trick Mono into making HTTPS calls. More details on that are in Kromenaker's post. 6) Make a new separate script and make sure you have "using Google.GData.Client;" and "using Google.GData.Spreadsheets;" at the top. 7) To grab the data from that script, you'll need to use that document key you copied from step 3 to pass into my GDocService.GetSpreadsheet( ); function. From there, use the list-based spreadsheet feed API to grab data from your spreadsheet, or look at the debug stuff in the GetSpreadsheet( ); function to get started with that. Keep in mind that all the data you grab will be of type "string" -- to get it usable as numbers, you will have to use int.Parse( ); or float.Parse( ); to turn the string into a number. Or let's say you have a dollar sign ($) at the beginning of each column value in the spreadsheet; you'll have to use string.Substring( ); or string.TrimStart( ); to take that dollar sign off. Ideally, you will cache the spreadsheet data when your game starts up, and work with that data. This is read-only access, and public access. You are telling Unity to read from a public spreadsheet feed that anyone can grab from their browser too.